There are two different ways of funding your BullionStar account. Step 1: Go to Your Account > Add Funds. 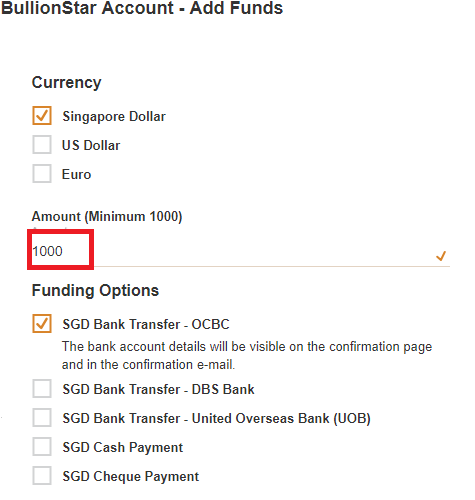 Step 2: Select the currency that you wish to fund your account with by checking the relevant checkbox under the “Currency” heading. 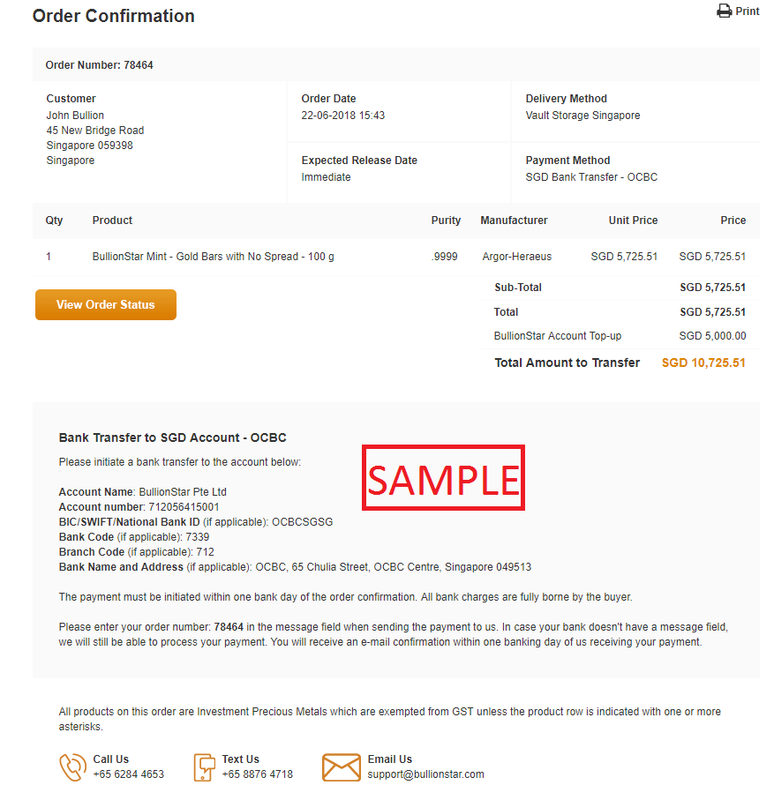 You can add funds to your account in Singapore Dollars, US Dollars or Euros. Enter the amount you intend to fund your account with in the field labeled “Amount”. 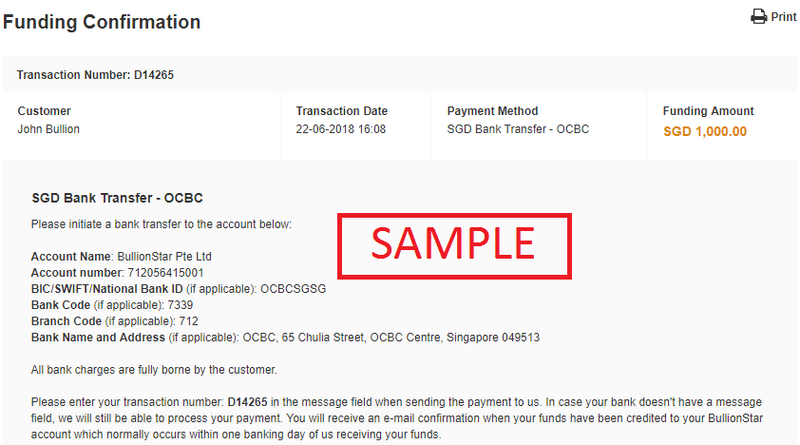 Please take note that the minimum funding amount is SGD/USD/EUR 1,000. Select your preferred funding payment option by checking the relevant checkbox under the heading for “Funding Options". You can add funds by domestic or international bank transfer, by PayNow (SGD only), by cheque (SGD only) or by cash (SGD only). Step 3: Select or enter your PIN Code. After reading and agreeing to the Terms and Conditions, check the checkbox and click on the button for "Submit Funding Notification to BullionStar". Step 4: After submitting your funding notification to BullionStar, you will be brought to a funding confirmation page with the funding instructions. Please follow the instructions listed on the funding confirmation page to initiate your payment to BullionStar. The funding confirmation will also be sent to your e-mail. BullionStar will normally credit your BullionStar account within one business day of receiving your funds. Step 1: On the Checkout page, there is a field labeled "Fund your BullionStar account with additional funds" where you enter the amount you would like to top-up your BullionStar account with. 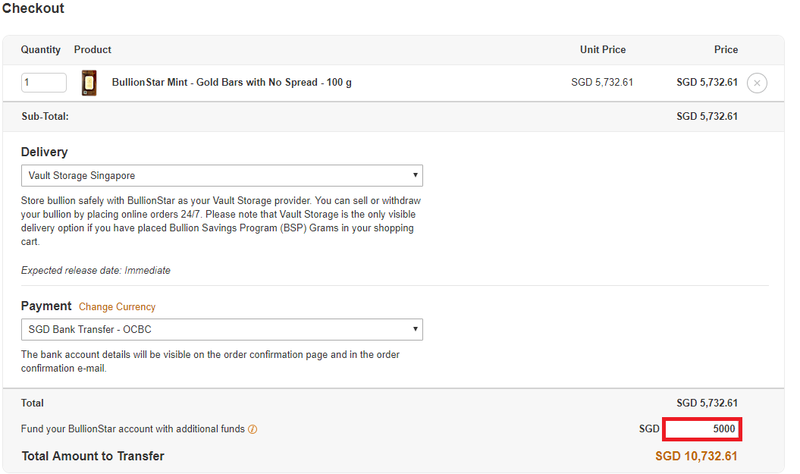 Step 2: After placing the order, you will be brought to the order confirmation page. Please follow the instructions listed on the order confirmation page to initiate the payment to BullionStar within one business day of placing your order. The order confirmation will also be sent to your e-mail. BullionStar will normally credit your BullionStar account within one business day of receiving your funds. Upon successfully funding your account, your BullionStar cash account balance will be visible after clicking on "Total Assets" at the top right hand corner. The "Cash Balance" section lists the available balances in the different currencies.